Nokia has today announced the Lumia 925 - the 920's metal-totting update, which promises a better range of capabilities for the photo enthusiast. As previously rumoured, the 925 lands with a 4.5-inch display but without full HD resolution (going for 1280 x 768b instead). A lot of the phone's attention is on the camera though, offering an 8.7 megapixel rear snapper (the same as the Lumia 920) with advanced lens technology for grabbing low-light images. Nokia Smart Camera mode is also a new addition to the handset, letting you snap ten images at once and then edit with features such as Best Shot and Motion Focus. The 1.5GHz dual-core Snapdragon processor is a little disappointing, as it's the same as seen in the 920, but the internal memory has been dropped to 16GB and with no microSD card slot to be seen. Users will also get 7GB of free SkyDrive cloud storage. In terms of juice, the 925 has a 2000 mAh battery, but wireless charging has been taken out and made available via an extra cover - which isn't going to please those that got on board with Nokia's wireless promise. Nokia also announced that Smart Camera Mode will also be rolling out as an update to all Lumia Windows Phone 8 devices. 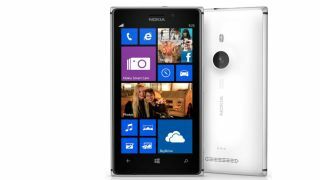 Costing 469 Euros (around £400/$610/AUS $610), the new Windows 8 Phone handset is expected to start selling in the UK in June, while it will roll into the US and elsewhere some time after that.